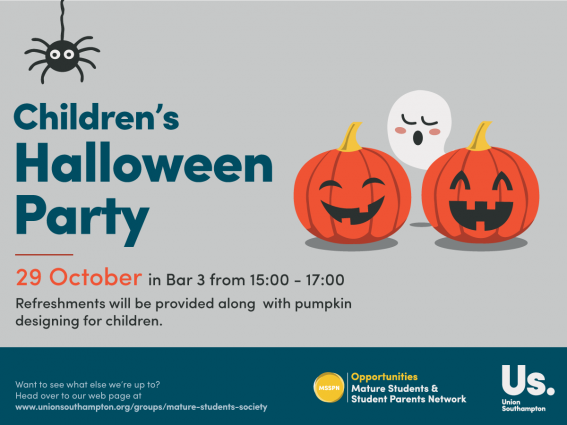 Gather up your little ones and take them down to The Diner (B42), Highfield campus for a spooky afternoon of fun and games at our Halloween-themed Party on Saturday 29 October between 15:00-17:00. You can relax and meet other student parents, while your children have the chance to get creative with pumpkin designing. Enjoy free refreshments to keep you going! We know that you have a lot to juggle with work and children, so there’s no need to book – just come along. If you’re interested in our events organised for student parents, check out our Facebook group for Mature Student and Student Parents Network.